This article shows a 4096 bit key being cracked by using a microphone and listening to your computer's cpu. I do not know if this is true at all. I am doing a presentation on RSA Security and I would like to include the largest RSA encryption to be cracked. This is not the same kind of attacks. You cannot compare factoring and side channel. The paper of this attack is RSA Key Extraction via Low-Bandwidth Acoustic Cryptanalysis by Daniel Genkin, Adi Shamir and Eran Tromer. Given the quality of the article and the names of the researcher, it is really hard to doubt the paper content. But be wary that press tend to make things worse than they actually are. e.g. a year ago, we had a paper on Freestart collision for full SHA-1, immediate press emphasis: SHA-1 is broken, we have a collision! Modern RSA security standards mandate key sizes of at least $2048$ bits (i.e., $1024$ bit primes $p$;$q$) in order to achieve adequate levels of security [BBB+12]. For concreteness, in the following we consider even larger keys, of size 4096 bit (and 2048-bit primes), which should be secure beyond the year 2031 [BBB+12]. We show an attack that can extract whole 4096-bit RSA keys within about one hour using just the acoustic emanations from the target machine. What you must show in your talk, is that even if this 4092 key has been broken, it is not the same kind of attacks. Here we are in the case of a physical attack rather than a factorization attack. It is the same as comparing side-channel attacks on AES as opposed to the usual cryptanalysis. 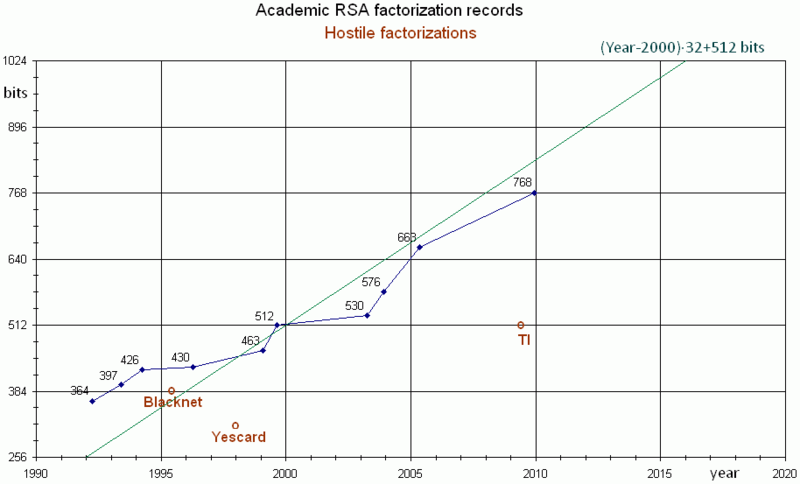 I suggest you have a look at the RSA challenge and Integer factorization records. Why has the RSA factoring challenge been withdrawn? For a perfectly secure and correct RSA implementation, factoring the modulus is the best attack we know of. The largest RSA modulus factored (also the largest semi-prime factored) is RSA-768, of the RSA Challenge. If you can't attack the math, you can attack the implementation, like in the side-channel attack you mentioned. Another example would be exploiting weak random number generators like this, where a weak random number generator generated public keys with common factors. Not the answer you're looking for? Browse other questions tagged rsa or ask your own question. Should new applications still use RSA? Is it worth going down the ECDH route for protocols? What are the possible applications of fully homomorphic RSA algorithm?